This is a small manual on how to use the Bambuser. 2 – Complete the data that you believe are appropriate for your profile. It is important to link the program to twitter or facebook, at least one (The twitter is very simple to locate you while you’re recording live, even more if you use the hashtag of your event). 3 – Download the application or program to your cell phone or/and computer. 5 – Press the red button and you’re broadcasting live from your goal! Remember to look for good connection! Make a note with information on the convocatory: why, who calls, etc.. We will help to document the event and context recording. Warn others people using twitter, media groups, etc.. that there will be a recording from that account. Respect people who do not want to be recorded: the group takes images where people canno’t be recognized. Before performing close-up, ask people if they want to be recorded. It takes about 3-4 seconds for the human eye vision appro, so try to ensure that every shot is long enough, and last long enough. In case you want to set various pictures/takes in the same “viewing frame” you need more time for each shot, so we must avoid the shots too short. You’re a ‘mediactivista’, not just a camera, so it’s important never lose the purpose of the action but the story is forgotten by the great political and commercial interests. Ask people what they havethey have sseen, how they are living it, and what they feel. Reminds videoviewers what is happening, and why it is happening. Tell what is not in the direct (things that have happened, or will happen). If you know you will disconnect soon and reconnect later, say so for people following you will be aware that you will broadcast again. Records posters, banners and anything else that provides information about why is the action. Try to film and interview the bystanders who are out of the action being recorded, as they may give an idea of the outside experience of the event and its impact. Remember to always ask if they want to be recorded. Guide the persons appearing in recording for their intervention. Do not take compromising/embarrasing footage. Respect the people who don’t want to be recorded. Try streaming group, so you can provide/receive technical asistance if needed and help each other in case there is a problem. Allows multiple retransmissions of image at a time. Has application for Android and iPhone OS smartphones (iPhone). The video has a simultaneous chat without necesity of being registered as user. Does not require extra applications to run on a computer with any operating system but does allow use some applications to add some extra functionalities. 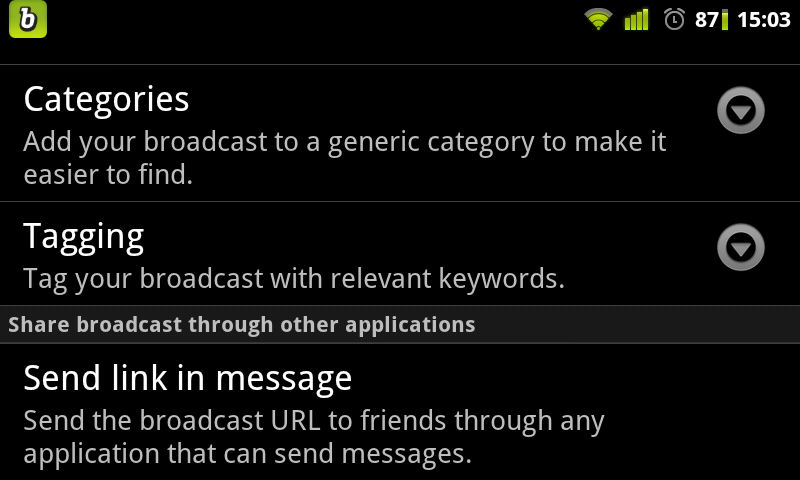 It allows automatic direct publishing broadcasts in major social networks and some alternatives. API available for custom embedding of broadcasts in web platformss. It has a system of hashtags in order to issue freely on information channels. Saves the frames that have not been able to be broadcast for later upload to the server and rebuilding of the whole video. Integrates well with LiveStream and other platforms of live streaming. The videos are played in Adobe Flash. It has no “studio” LiveStream system, which allows a play queue for the channel. If you already have an account Bambuser and you want to know how it works, go to the next section. To create an account we must turn to the option of “Sing Up” on their website (http://bambuser.com/signup). There you can fill the form with the required data (do not ask personal information), taking into account that it does not require email confirmation, but it may be useful put your mail to recover the password. Once your account is created we will choose whether we want to connect it to Facebook or Twitter accounts, you can also skip this step and proceed to the next. In the next step is a tutorial for using the mobile application or the computer’s webcam, you can ignore and go directly to the “dashboard” (next section). It is the original home on the web when you have an account on Bambuser (http://bambuser.com/dashboard). It can be downloaded from the respective “Market” for each smartphone operating system, also from the website Bambuser (http://bambuser.com/phones). 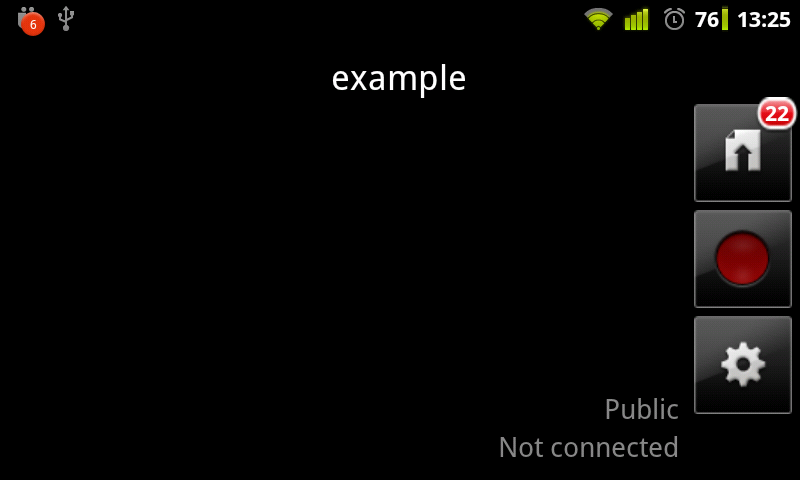 This application can only be seen with the screen on landscape position (horizontal). To edit the title we must click on the phrase that appears at the top of the screen. The title of the video is important when describing briefly what is your transmission. This title is what will people see when coming into your channel and it will also be the title appearing on social networks you’ve connected. – It should be brief and descriptive at the same time time. – If you are on twitter it should contain hashtags or mentions related to the subjsubject. For more details, learn about Twitter. – The title can be changed while transmiting, but this will be published in the following video that you’ll make. This button has a “gear” shape and is situated at the bottom right of the screen. It is important that the settings are correct to maintain the balance between transmission speed, transmission quality and stability. Although this last one depends mostly on the internet conexion. This option lets you choose the resolution, which can be understood as the number of fragments (pixels) that make up the image. It is defined as follows: A x B, where A is the pixels of width and B the height. The higher the resolution, the more detailed the image will be but also more difficulties while transmiting -quality vs.speed. We recommend using a high resolution for high-speed connections such as WiFi, and lower it for low signal using GPRS or 3G. The resolutions available depend on the ability of the camera lens of the device. This is one of the most important options to consider and you should always check it before starting to cast. A minimum of 300 pixels wide and up is recommended to appreciate the image correctly. These options let you choose in which Bambuser channel we will issue, we must introduce data of the first step before starting to cast. Can not be issued without having first introduced these options. The data are remembered after you close the program and reopen it. If the mobile device has several objectives, such as front and rear camera, this option lets you choose which one to use to capture video. The front camera for video calls tend to have less resolution. It is not as important as the resolution, but the operation is similar -quality vs.speed. The sound is much easier to deliver than video and can maintain high quality in most cases. It is useful to rise up the quality when you need to listen to the video and can be lowered if the sound is not relevant in the transmission, which in turn entails a proportional variation in terms of difficulty of transmission -quality vs.speed. This setting allows to choose whether or not the video information not transmitted will be stored in the device’s memory to be output latter on, which allows to complete videos that have been cut in moments of low connection. Although our title can describe the geographical position where we are, this option includes the GPS data, if available, or else the connection positioning to place the video in specific coordinates that can be associated with a city or region. This button is the red one, located on the right side of the screen, when activated: the video recording starts and so its direct transmission over the Internet. Before activating it, it is advisable to seek a stable internet connection, otherwise the video will be cut or will accumulate frames in the phone. 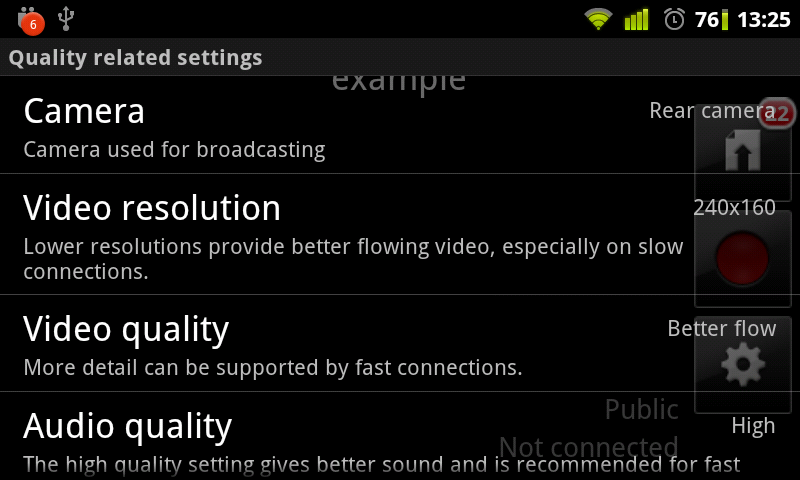 It is also recommended to have configured the program, especially the video resolution. Attention! Sometimes, if we are using an internet connection underpowered and resolution is set above the minimum of the camera, a message appears with two options: to apply the minimum of the camera or ignore. Despite the usefulness of this option, because applying the minimum will help improve the transmission, the minimum tends to capture a completely unapreciable image. Thus, it is recommended to ignore this message (button “skip”) and above all have previously configured the most appropriate resolution according to the criteria described in the configuration section. Furthermore, when this button is pushed a link to the video is also automatically published in some social networks . For more manual publications a “social network button” appears just after starting the transmission. Once transmitting is on this button will become “stop”, in the shape of a square. Pressing it now to stop the transmission and the video will close. This button appears when the transmission has started and stabilized. Watch out! In this application, especially in the version for Android, it is often just below the title and is difficult to click on. Try to touch it at one of its corners. When we open this button, appears a list of social networks that we have available and others can be added depending on the configuration we have given our Site Dashboard. You can write the twit to be sent, by default will be introduced the title of the video. Watch out! The application has no character counter and a twit with more than 140 character will cause a failure error message in the message box. When open, a list of pages and profils where we can post the link, wclicking each will get a confirmation that the publication was made.